Guest Shot – by Adam Pankratz. 2015 Liberal candidate in Burnaby South. Burnaby South has been in the news a lot lately. Burnaby? In the news? Not something we used to read very often, but Burnaby residents have gotten used to the spotlight lately. Whether it’s Kinder Morgan in the north, or Jagmeet Singh in the south, Burnaby’s ridings have been the focal points of several major news stories for 2018 and 2019. Political observers are talking about how Jagmeet Singh will fare in his bid to gain a seat and become an MP as he deals with turmoil within the NDP. Win or lose Mr. Singh will face serious headwinds…but lose and he’s finished. Will the voters of Burnaby give him his victory and a chance to lead the NDP into the next general election in October? Kinder Morgan – it’s the issue everyone wanted to talk about 6 months ago, and Jagmeet Singh opened his candidacy by attacking the “leaky pipeline.” I said then that Mr Singh missed the mark with Kinder Morgan, which is a minor issue in Burnaby, and not one that would decide the by-election here. The current situation in Burnaby, despite all the attention heaped on it through the summer and fall, is that no candidate is focused on Kinder Morgan. Burnaby residents are ultimately practical and realistic on Kinder Morgan, as are most Canadians. Responsible resources extraction is necessary for the Canadian economy and the residents here recognize that. It is a very loud minority who made it the issue it was. What the candidates have all zeroed in on is the major issue in Burnaby of housing. It is the issue which sank Derek Corrigan, the four-term mayor of Burnaby, who lost to current mayor Mike Hurley last October. Once again, the issue is front and centre. Like all the Lower Mainland, Burnaby is expensive and residents here want to see more action taken at all levels of government. These issues are in many ways similar to the ones I came across doorknocking and speaking with residents during my 2015 federal election campaign. During that election there was also serious concern about the Harper Government and their impact on Canada’s image and sense of ourselves as a compassionate society. Canadians want a government that listens to them and understands their concerns and Burnaby residents are no different. That is why I always thought, and still do, that Mr Singh’s major challenge this by-election is gaining local credibility with Burnaby voters. Pankratz campaign: won Election Day, but could not overcome strong NDP machine delivering support to the advance poll. Mr Singh clearly thinks Burnaby is an NDP slam dunk or he wouldn’t be here. History is on his side, but will Burnaby voters deliver what Mr Singh expects? “All Burnaby” ridings (that is, ridings entirely within Burnaby, not split over city boundaries) have gone NDP for over 40 years. Mr. Singh and the NDP clearly are hoping for a repeat of the voting pattern in October. There is, however danger in this. Burnaby is changing and the 2015 general election proved that. In that election Burnaby North Seymour went Liberal and in Burnaby South the incumbent Kennedy Stewart narrowly hung on to best me by 547 votes. But the larger gamble the NDP and Mr Singh are taking is assuming that Burnaby residents are the same as they were 40 years go (they aren’t) and thinking they will readily accept a candidate who parachuted in, with no community connections. I believe Burnaby residents want an MP who knows the community and understand them. I remember distinctly that the most common response to our team in 2015, an election in which we doorknocked for over a year prior to Election Day, was “No one has knocked on my door since Svend was our MP.” “Svend” is, of course, Svend Robinson, who served Burnaby for 25 years as MP. Like him or hate him, Svend was someone who understood Burnaby, worked tirelessly to be present locally as an MP and develop personal relationships with his constituents. Svend’s rival at the time, Bill Cunningham (Liberal) and successor (Bill Siksay) also had deep, long standing relationships with Burnaby. Burnaby misses this. It is no doubt one of the key reasons our election campaign did so well in 2015, despite the entrenched NDP history. Local wins here. The fact that recent NDP representative Kennedy Stewart resigned as MP and immediately began touting that he was from Vancouver and always wanted the job of Vancouver Mayor has only deepened the desire of Burnaby residents for a long-term MP intent on local priorities and issues. What can we expect of this by-election? At the outset my opinion, bluntly put, was that Jagmeet Singh should have lost Burnaby South decisively. However, current events have conspired to make that loss seem unlikely. Due to the close race in 2015, the story everyone (sensibly) made was that this would be a tight race between the Liberals and the NDP. However, the former Liberal candidate, Karen Wang, was forced to resign due to comments she made on WeChat regarding Mr Singh. This botched campaign start, followed by the scramble to replace her has hurt Liberal credibility locally. Now, the national Liberal scene is being shaken by the SNC-Lavalin affair. Does this mean the Liberals are cooked in Burnaby South? No, but they have made their lives significantly more difficult than it ought to have been. One party not being talked about at all is the Conservatives in Burnaby. They have flown under the radar in this by-election despite strong results in 2011 (40%) and even 2015 (27%), given the circumstances. In my mind they were a dark horse contender until the People’s Party of Canada was founded. This long shot is now essentially non-existent. The PPC is running an ostensibly strong candidate in former local school trustee candidate from 2018 Laura-Lynn Tyler Thompson. Ms Thompson has been controversial for her anti-SOGI comments and stance on similar issues, yet still received over 15,000 votes in the 2018 municipal election. While campaign signs don’t mean anything at the ballot box, it’s hard not to notice the disproportionately high amount of PPC signs around Burnaby, given the party is supposed to almost be a fringe joke nationally. If Ms Thompson can rally her supporters from 2018, I would watch for the PPC to seriously surprise people and perhaps even see Burnaby South legitimize the PPC as a minor party. Jagmeet Singh meanwhile continues to be at best an unknown, enigmatic figure for most Burnaby residents. He talks in bland platitudes, doesn’t have a clear stance on anything and equivocates when asked direct questions. At his first press conference he claimed to be “All in on Burnaby.” He isn’t. His strategy seems to be “Burnaby will vote NDP no matter what.” Past that, it’s hard to see any notable impact he has made on the community or its residents. In the end, despite his lack of connection to the riding and lack of understanding as to what makes Burnaby tick, I foresee Mr Singh and the NDP pulling this one out on the basis of history. The Liberals did themselves no favours in the run up to or first half of the by-election and simply have too much ground to make up. The Conservatives will be split by the PPC and fade away. So the surprise is that the Liberals and Conservatives do not look like they can take advantage of a weak NDP leader with no connection to Burnaby, while the upstart PPC might have a boost that puts fuel in its tank. Politics is always interesting in BC. A chain of events has cascaded upon the federal government and Liberal Party of Canada over the past week. First, where are things at? Hon. Jody Wilson-Raybould resigned from Cabinet. She has not resigned from Caucus. She remains a Liberal MP. She is the presumptive Liberal nominee in Vancouver-Granville for the 2019 federal election, having been ‘green lit’ by the Party in 2018. She has not voted against the government on a whipped vote. In fact, as a senior member of Cabinet, she helped shape the government’s agenda over the past three-plus years. As far as I know, the only ‘difficulty’ that exists is disagreement, and related events, stemming from the SNC-Lavalin issue. Thus, I am going to assume that Wilson-Raybould remains a Liberal in the partisan and ideological sense. An assumption, but I see no evidence to the contrary. In Canada, we have not demonstrated a lot of tolerance for public dissent within political parties. The media punishes political parties for dissent, treating it as a sign of weak leadership. Dissent certainly exists privately. Every political caucus in Canada has a wide range of opinion about what its party leadership should be doing and usually a considerable amount of complaining. It mainly stays inside the room. In major political parties, not everyone gets along. Uneasy alliances exist, in fact, they are essential to the growth and success of parties. Chretien-Martin. PET-Turner. Mulroney-Clark. Harper-MacKay. Cabinets and caucuses don’t have to like each other to work together. In the UK, dissent is much more of the norm and widely accepted. MPs routinely challenge and speak out against leadership. It doesn’t always have to be bunnies and rainbows in order for people to serve together and to campaign alongside together. A common enemy unites, come election time. Had the shuffle not happened, I assume she would still be Minister of Justice (and the fact the shuffle did happen in the way it did will go down as one of the top unforced errors of the first term). This would be playing out behind the scenes. It seems the reactions to the public disagreement exacerbated the situation to the point where she resigned from Cabinet. Is it possible for her to remain as a Liberal MP? If, as outlined above, she remains a ‘Liberal’ and continues to support the broad policy agenda of the government, not only should she remain a Liberal MP if she chooses, but she is basically untouchable. Party leadership would have to proactively rescind her candidacy, which I am sure they would be loath to do. The support of her local membership is not a requirement, however, it is probable that she is well supported locally. There is an assumption held by many that the only meaningful way to contribute in politics is to serve in Cabinet. But one can make significant contributions outside Cabinet, especially an MP who has a strong national profile. Over the past week, Wilson-Raybould has enhanced her stature in Canada. She has a constituency of support out there in the country. When she speaks on an issue, she will be heard. She would be a force to be reckoned with in Parliament. Most Liberals are unhappy about these events, and some have come to the public defense of the PM, and others to ‘Team Jody’. Such controversies compromise the ability of colleagues to get re-elected, and may even jeopardize the survival of the government. It’s also fair comment that almost all Liberal MPs are all there because of one guy – Rt. Hon. Justin Trudeau – who rescued the Party from oblivion and led them to an improbable majority in 2015. In fact, the sense of invulnerability has contributed to the magnitude of this issue. Yes, Liberals do owe Justin Trudeau. But, they also owe him their honest opinion, for the good of his leadership and the party. Wilson-Raybould staying in Parliament, serving as an MP, running for re-election as a Liberal is not something that is really being contemplated publicly in the current context. It seems to be assumed that this is leading to a break-up. By staying put, Wilson-Raybould would have presence in Parliament and serve as a moral conscience from outside Cabinet. In time, who knows where the road will take her? She could cross the floor and serve with another party. But if she continues to identify as a ‘Liberal’, that doesn’t work, and where would she cross to, anyway? Neither the Conservatives nor NDP would seem to be attractive options for her. Or she should could leave federal politics, but that would be regrettable. She has barely started, and Vancouver-Granville voters permitting, should have more runway ahead. This is about more than one MP’s political future Hon. Jody Wilson-Raybould is the first indigenous woman to ever be elected from British Columbia. It took 148 years to get there. Making room for disagreement and dissent is messy, and as a former political manager, it made my life complicated and could be very frustrating. But, it’s ultimately good for the system. Let the events of SNC-Lavalin play out. Changes can be made, lessons can be learned, people will move on to other issues once that has all taken place. “How this ends” could well be JWR on the ballot as a Liberal in October 2019. In fact, it would be a new beginning, for everyone. Premiers. Coal barons and coal disasters. Firebrands. Death. Champions of the working class. Champions of Women’s Suffrage. Party leaders. Cabinet veterans. Speakers. Underdogs. Coalition Makers. Scandal. Crushed Grapes. “The Greatest Canadian”. A pirate. A less than sober coronation. As we look toward Nanaimo’s January 30thbyelection, I graze through the history of one of BC’s most intriguing ridings. When former Vancouver Province ace reporter and award-winning author Don Hauka steps out his front door in the Royal City and gazes south, he likely has trouble mustering kind thoughts about one of Nanaimo’s earliest representatives who influenced the course of history, while under the influence. Hauka lives on 5thStreet in New Westminster. The street is much wider than other streets because it was to be the boulevard leading up to the provincial legislature that was supposed to be built there when the colonies of Vancouver Island and British Columbia united in 1866.
famed BC historian Margaret Ormsby, he intended to make a strong statement in favour of the mainland capital, but on the day of the debate, he was a “little shaky” owing to some refreshments consumed. His seatmate, Victoria supporter William George Cox, seized on the opportunity. The ship’s captain rose reading from his prepared text comparing New Westminster on the Fraser River to Calcutta on the Hoogley River, arguing that New Westminster would enjoy Calcutta’s prosperity. However, as he finished the first page, Cox shuffled the papers to put page one back at the top, which Franklyn re-read, repeating his parallel to Calcutta. This happened a third time and hilarity and mayhem ensued. In the meantime, Franklyn had put his spectacles on the table whereupon Cox removed the lenses from their frame so that Franklyn “could not see the Hoogley or anything else”. The House was in an uproar as the hapless Franklyn twisted in the wind. Speaker John Helmcken, a firm supporter of Victoria’s bid, moved a recess then, when the House reassembled, he ruled that Franklyn could not make a second speech. Victoria went on to win the vote 13-8 and the rest is history. Franklyn was removed from his post not long after by a disappointed Governor Seymour who favoured New Westminster. And 150 years later, Don Hauka is not prepared to forgive Franklyn’s bumbling nor Victoria’s treachery. Sheesh, all that before Confederation. What about the next 150 years? With the Nanaimo byelection taking place January 30th, it caused me to reflect on Nanaimo’s history in provincial politics. The following is a glimpse – a few stories and a little colour. I am not pretending to be an expert when it comes to Nanaimo’s history, but I lived in the area for over 15 years and certainly find it interesting. I encourage comments to add insight and missing facts, especially where I have missed the mark. There are few riding histories that I’m aware of that connect modern-day politics to BC’s beginnings as a province. Nanaimo is a good place to start. Political junkies, enjoy. In the first election as a province, Nanaimo elected a premier. He wasn’t the premier then and there, but John Robson would ultimately become premier of BC and have its highest peak and one of its most famous streets bear his name. Robson was a lively force. A newspaper editor, he was cited by contempt by Chief Justice Matthew Baillie Begbie, and was a burr under the saddle of Governor Douglas. He moved his newspaper from New Westminster to Victoria and sold it to the rival Daily British Colonist (precursor of today’s Times-Colonist). He was a strong supporter of BC joining Confederation, and when BC joined in 1871, he ran and won in Nanaimo with 57 votes to his opponent’s 33. He only served one-term representing Nanaimo but he went on to an important career in provincial politics representing other areas, ultimately assuming the premiership in 1889. He died in office, in 1892, when he hurt his finger in the door of a carriage during a visit to London and succumbed to blood poisoning. Robson was one of two premiers who represented Nanaimo during their career. Nanaimo before and after Confederation was a coal town. There are many good books and sources about Nanaimo’s coal history, especially by author Jan Peterson, who has written six local histories. In fact, I would defer completely to Peterson on any historical points. A chance encounter between Snuneymuxw Chief Che-wich-i-kan [or Ki-et-sa-kun] and a blacksmith in Victoria set the wheels of development in Nanaimo in place. Che-wich-i-kan, historically referred to as “Coal Tyee,” had gone to Victoria to have his gun repaired. He commented about black stones being plentiful in his area. This conversation was repeated to HBC authorities, who then invited the chief to bring some of his black stones to Victoria. In return, he would get a bottle of rum and have his gun repaired free. The date was December 1849. The following spring, Coal Tyee returned with a canoe laden with coal. A company clerk, Joseph William McKay, was quickly dispatched to Nanaimo. The Snuneymuxw negotiated a treaty with the Crown in 1854. According to the Snuneymuxw First Nation website, “In order to access the coal, the Colonial authorities knew that under British Common Law, and as a matter of practical reality, they had to conclude a Treaty with the Indigenous owners of the land, which in coal-rich Nanaimo were the Snuneymuxw. The goal of treaty-making was to achieve, through recognition and respect of Snuneymuxw, access to the coal deposits.” (A few years ago, Vancouver Island University created the Centre for Pre-Confederation Treaties and Reconciliation to further explore issues related to the 1854 treaty). From there, Nanaimo became a coal town with the Hudson Bay Company benefiting, along with the companies that followed. Today, underneath Nanaimo there are coal tunnels and shafts in every direction, remnants of the Age of Island Coal. Another local book, When Coal was King, by VIU professor John Hinde, outlines the rise of the Dunsmuirs. Robert Dunsmuir and his wife emigrated to Vancouver Island from Scotland in 1850 as an indentured miner for the HBC. The voyage to the west coast took months and numerous members of the crew deserted to take part in the California Gold Rush. Thus, son James was born at Fort Vancouver on the Columbia in 1851. Dunsmuir’s uncle worked for the HBC in Nanaimo and there he went. When his uncle’s contract expired, he tried to convince Robert and his family to return to Scotland. They decided against it and stuck it out in Nanaimo. He laboured for almost twenty years, prosperous but not extravagant. He discovered the Wellington seam in 1869 and formed his own venture, beginning production at new pits at Wellington in the Nanaimo area, in 1871. By the 1880s, Dunsmuir was dominating the coal industry on Vancouver Island at a time when coal was the world’s dominant fuel. On August 13, 1886, John A. MacDonald drove in the Last Spike of the E&N Railroad at Shawnigan Lake, built by Dunsmuir, which Hinde calls “the deal of the century”. The railroad was the subject of considerable political controversy, which Dunsmuir shrewdly exploited. Vancouver Island today in many ways remains the architecture of the Dunsmuirs. Historian Jean Barman writes, “The Dunsmuirs’ total concern with profit extended to their treatment of employees. The accommodation rented to workers was primitive, lacking even running water… Death and injury were commonplace because of company negligence”. The Dunsmuirs’ approach of hiring cheaper labour and working conditions led to confrontation, which was dealt with ruthlessly. Dunsmuir had a rags to riches story and his riches were astonishing for that time. Dunsmuir would move to Victoria and build Craigdarroch Castle as his residence. Though his political base and wealth derived from the coal pits of Nanaimo, his influence went much further beyond. Craigdarroch: What would Robert Dunsmuir have thought of spec taxes? His electioneering statements and legislative voting record indicate that he was in favour of economic development, an advocate of temperance, opposed to gambling, unwilling to extend the franchise to women, and above all a rigid supporter of the right of employers to hire Chinese labourers. Although he received public criticism for his support of capital in general and the Dunsmuir empire in particular, Bryden seems to have been well respected by his election opponents. In his capacity as shareholder, he launched a successful constitutional court action that allowed the Dunsmuir empire to continue hiring Chinese labour, which were paid much lower wages. This was one of many issues that sparked labour revolts. Robert Dunsmuir himself was elected in 1882 along with William Raybould when the seat carried two members. Dunsmuir immediately joined the Cabinet of Premier Alexander E.B. Davie. There were no conflict-of-interest laws in those days. Dunsmuir’s business interests continued unabated, as did his political power, though sons James and Alexander took on more responsibilities with the business and it thrived. In the 1888 session, Dunsmuir was accused of favouring BC’s annexation to the United States. MLA T.B. Humphreys (Lillooet) went as far as moving a motion of censure. The matter was deflected to a select standing committee, which exonerated Dunsmuir. Dunsmuir’s political success left Nanaimo mineworkers and labour activists “dejected”, writes Ormsby, which is understandable. The polarization between the richest man in British Columbia, and his organization, versus mineworkers marching toward increasingly radical politics, was growing. It would manifest itself in terms of strikes, riots, and arrests for many years, but it would soon show itself at the ballot box. However, Robert Dunsmuir would never taste defeat. He died in 1889. In fact, Raybould also died during the same term of office, probably the only time in BC history that both members (of a two-member riding) died. It would be a short wait before Labour forces made their mark at the ballot box. And it wasn’t the end of the Dunsmuirs in politics either. Remembering that party politics were not formalized in BC until the election of 1903, there were basically three types of candidates – those who supported the Government, the Opposition, or Labour. Forster and Keith were both nominated by the Miners’ and Mine Labourers’ Protective Association (MMLPA) and campaigned on the “Workingmen’s Platform” of the Workingmen’s Campaign Committee (Nanaimo Free Press, 19, 28, and 31 May 1890). In 1894, Labour candidates had a setback. With three Nanaimo area ridings in the 33-seat Legislature – North Nanaimo, South Nanaimo, and Nanaimo City – all three Labour candidates were shut out. This election marked the return of Dunsmuir’s son-in-law John Bryden to elected office, and also saw the election of William Walkem, a physician who had narrowly lost in 1890. Walkem’s brother, George, had served as BC premier from 1878-1882. While Bryden was returned in 1898, Walkem was defeated handily in South Nanaimo by Ralph Smith, a Labour-Oppositionist candidate, which meant he had the backing of Labour and those that also opposed the government. Smith had run in 1894 but had lost to Bryden. The election of Bryden at the same time as the election of Labour MLAs demonstrates the support that each side of the management-labour divide had in the City overall – a divide that has ebbed and flowed over Nanaimo’s history. Of course, when looking at early voting results, it’s important to be mindful that the electoral franchise was very limited during those days. These early results are completely absent of female participation, among other restrictions. and would ultimately serve as a Liberal MP. He returned to provincial politics in 1916, from a Vancouver riding, and served as Minister of Finance under Premier Harlan Brewster, but he died in office. Prior to his death, a provincial referendum resulted in 65% (of men) voting to extend the vote to women. His wife, Mary Ellen Smith, ran in his vacant seat and became BC’s first MLA and first female cabinet minister in the British Commonwealth. But back in Nanaimo in 1901, Smith’s departure opened the door for one of the most significant politicians in British Columbia – James J. Hawthornthwaite. Elected as one of the first Labour-backed MLAs in BC history, he would co-found the Socialist Party of British Columbia. He came to BC in the late 1880s and found his way to Nanaimo to work as a real estate agent for the New Vancouver Coal Mining and Land Co. Ltd. Its owner, Samuel Robins, was a bitter rival of the Dunsmuirs. Hawthornthwaite was influenced by Ralph Smith, who was then secretary of the Miners’ and Mine Laborers Protective Association, and would marry the daughter of Mark Bate, Nanaimo’s first mayor who served 16 terms between 1875 and 1900. Bate is the focus of one Jan Peterson’s local histories. Hawthornthwaite was elected as a Socialist, along with neighbouring MLA Parker Williams. The two of them enjoyed electoral success between 1903 and 1912. Hawthornthwaite was the “socialist intellectual”, says historian Allen Seager. His politics would diverge with his former ally Ralph Smith but “his approach did not alienate him from the mining population; his speeches earned him great applause at public meetings”, writes Hinde. Williams, on the other hand, was a Welsh miner and trade unionist. He made his way west finally settling in Cedar. While Hawthornthwaite focused on Socialist theory, Williams “concentrated on wages, safety, and the right to organize”. Hinde writes that William was “unpolished and crumpled”; one local writer declared, “No amount of grooming and combing would transform Parker Williams into Beau Brummell”. In the 1903 election, the first that political parties contested in British Columbia, the Socialists were centre stage. The Conservatives led by the youthful Richard McBride held 22 of the 42 seats, the Liberals 17. The two Nanaimo Socialists held two seats, along with other independent Labour allies in the Legislature, which gave them an important role with a government that had a thin majority. Author John Hinde describes Hawthornthwaite and Williams as “evolutionary” rather than “revolutionary” Socialists. Hinde continues, “The main weapon in the Socialists arsenal was the ballot, the ‘Gatling gun of political power’”. Hawthornthwaite’s contributions were far more constructive than revolutionary and had included rudimentary farm security legislation in 1901 and a workmen’s compensation act in 1902. When Conservative premier Richard McBride* took office in June 1903, he had only a small majority so he turned to Hawthornthwaite for support. Thus, Hawthornthwaite was able to push for additional legislation, including improved safety standards and labour reforms in the mining industry. The premier used members of the socialist caucus to sound out the opinion of the popular class on a narrow range of issues. In return, Hawthornthwaite and his associates eschewed detailed criticism of McBride’s policies of development. There were limits to such arrangements. For example, McBride allowed members of the socialist caucus to lead the fight for women’s suffrage, but applied no party discipline to bring it about, though he personally supported enfranchisement of women as part of his “white B.C.” policy. In addition, administration of labour legislation sometimes made a mockery of the reforms enacted during McBride’s premiership. Hawthornthwaite’s correspondence shows that the enforcement by government officials of different parts of the Coal Mines Regulation Act depended on his persistent efforts and those of other elected officials. Nevertheless, and although accumulated grievances in the Vancouver Island coalfield would later boil over into violent confrontation, for a time the socialist alternative of a “strike at the ballot box,” the slogan of the socialist Western Clarion(Vancouver), had unexampled success. In 1907, McBride won 26 seats, a stronger majority, though the Socialists ran 20 candidates and elected three, including the two Nanaimo MLAs. Hawthornthwaite would resign his seat in 1908 to contest the federal election in opposition to Ralph Smith, who was running with Wilfred Laurier’s Liberals. Smith won, but Hawthornthwaite won back his provincial seat in the subsequent byelection. In 1909, McBride dominated with 38 of 42 seats. But yet again, Hawthornthwaite and Williams prevailed, holding between them as many seats as the decimated Liberals. Then in 1912, McBride did it again. He won 39 of 42 seats. The Socialists held two seats in Nanaimo, Parker Williams, but this time, it was John Place not Hawthornthwaite that was Williams’ seatmate. As a sidenote, the Nanaimo MLAs split from the Socialist Party of Canada at this time, and moved to a different banner – the Social Democratic Party. Hawthornthwaite moved on to other business interests, which drew criticism from some Socialists, and he also had a close friendship with McBride. World War I intervened and the politics of British Columbia would change. In the 1916 election, William Sloan of the Liberals gained a Nanaimo seat while Williams was re-elected in Newcastle. The miners vote was beginning to be diluted by demographic change. Williams would resign a year later to take a provincial appointment and who ran to replace him? Hawthornthwaite stepped back in. This would be his last term. It was said that he had been stirred politically by the Bolsheviks and may have met Lenin in his travels. At times we had the pleasure of reporting genuine orators. One such was James H. Hawthornthwaite, Socialist, Cowichan-Newcastle… When [he] rose to speak there was invariably marked attention on all sides. He spoke almost with a bite to his words, sometimes with a harsh, choppy delivery, no doubt for emphasis. But smooth sentences flowed like lube oil under pressure, and if the Socialist member for Cowichan-Newcastle had been enunciating Liberal party policies, Premier Oliver could have called a general election any time and been sure of a majority. In 1920, in the riding of Cowichan-Newcastle, Hawthornthwaite would be defeated by Federated Labour Party candidate Sam Guthrie, thus ending his political career. The rise of Labour politics in Nanaimo is discussed extensively in this article by Allan Seager. With all this talk of Socialists, we must take a moment to return to the election of the second Premier of BC who represented Nanaimo, James Dunsmuir, son of Robert Dunsmuir and heir. Unlike Robson, he was premier while representing Nanaimo. He would also serve as the Province’s Lieutenant-Governor. Dunsmuir entered provincial politics in 1898, winning a seat in the provincial legislature, and he became the 14th Premier in 1900. His government attempted to resist popular pressure to curtail Asian labour and immigration, not for humanitarian reasons, but to ensure a cheap labour pool for business. It also promoted railway construction and accomplished a redistribution of seats to better represent population distribution in the province. Dunsmuir visited England and the United States in 1902, but disliked politics after his return and resigned as Premier in November 1902. In 1906, he became the province’s eighth Lieutenant Governor. He retired in 1909 and lived out his remaining years at the baronial mansion that he had constructed at Hatley Park. In fact, Dunsmuir’s first win was in Comox in 1898, another coal producing area. He contested South Nanaimo riding in 1900 and won by a mere 24 votes (249-225) over the Labour candidate, reflecting the divide in the community. It also represented the fact that the Dunsmuirs did have support to counter opposition from mine workers and rival mining interests. He went from there to the Premier’s chair in the final term of the BC Legislature before party politics took hold in 1903.
reluctantly, was one of the few candidates who might possibly become Premier with any sense of real honour and dignity… He was certainly no politician – in public his manner was somewhat cold, and rather reserved.” He took office on June 16, 1900. His administration was not especially noteworthy and he did not particularly enjoy his duties. His secretary, R. Edward Gosnell observed, “The fates threw him into prominence which, by choice, he would have avoided. He had neither a liking nor an adaptability for public life…”. Jackman opines that Dunsmuir “ought never to have been a Premier at all; he did not like the job for he was totally out of his element, he hid not understand politicians and he never properly grasped the methodology of legislative government. In a way, he was a typical example of … the rich tycoon”. He resigned in 1902 following a triumphant trip to King Edward VIII’s coronation where he and his wealth were embraced in high circles. He would be appointed Lieutenant-Governor in 1906 and serve to 1909. I should note, given that I lived in the area for 15 years, that James Dunsmuir founded and named Ladysmith. The town was laid out in grid format to be a bedroom community for miners, who would commute to the nearby Extension mines by rail. The coal was shipped out via Transfer Beach in Ladysmith Harbour. During the time that the town was being built, the British won a key battle in the Boer War – the Battle of Ladysmith. In a fit of patriotism, Dunsmuir declared, “I shall call this place Ladysmith!” (I’m imagining that part). In any event, the streets of Ladysmith bear the names of Boer War generals like Baden-Powell, Methuen, and Roberts, for a battle taking place in faraway South Africa. It hearkens back to a time of unquestioning support of the Crown and Mother England. Nanaimo has always been a left-wing, workers’ paradise! There’s a hiccup in that narrative. While we have extensively covered the coal-dusted ground upon which Socialist-Labour pioneers like Hawthornthwaite, Williams, Place, and others trod, there was an extensive period where the Liberals triumphed. Two MLAs dominated Nanaimo politics during that time: William Sloan and George Pearson. Sloan had been a Liberal MP in Comox-Atlin (Comox-Atlin, what a riding!) from 1904-1909, stepping aside to make way for another candidate. He resurfaced politically in the 1916 election in Nanaimo. He was a minister of mines, fisheries, and provincial secretary for Liberal governments that served during the entirety of his provincial career. He died in 1928. His son, Gordon Sloan, would serve as the province’s Attorney-General under Premier Duff Pattullo and lead Royal Commissions on forestry in later years. Succeeding Sloan was George Pearson, who represented Nanaimo from 1928 to 1952. Pearson won six consecutive times. The first win was in an election where his Liberals were hammered. After 12 years in power, it was time for a change, and Simon Fraser Tolmie’s Conservatives took the reins. Pearson and the Liberals would return to power in 1933. The George Pearson Hospital in Vancouver was named for him as was the Pearson Bridge in Nanaimo. He served as Minister of Labour and was particularly adamant in his support for the internment of the Japanese population following the attacks on Pearl Harbour. According to Margaret Ormsby, George Pearson played a key role ending the Liberal government of Duff Pattullo, and the formation of the Coalition government that ruled from 1941 to 1952. The day after the 1941 election, which was a minority Liberal government (21 Liberal, 14 CCF, 12 Conservative, 1 Independent), Pearson “argued that the Premier no longer controlled a majority of members in the House”. Shortly thereafter, the leader of the Conservatives, Pat Maitland, called for a coalition government, which he said should include the CCF. CCF leader Harold Winch, now Opposition Leader, rejected the idea. Pattullo called a cabinet meeting with his post-election cabinet, but Pearson refused his offer to make him Minister of Education and Provincial Secretary, indicating that he felt there should be “an arrangement” with the opposition parties to form a stable government. Then Finance Minister John Hart said he favoured a coalition. As events unfolded, the Liberals announced a convention. A resolution hit the floor proposing the creation of a coalition government, which was carried decisively. Pattullo rose and left the hall. Pearson “worked his way to the front of the room” and nominated John Hart. Pattullo resigned as premier and Hart formed a coalition government, with Nanaimo’s Pearson at the centre of the action. While Sloan and Pearson were triumphing during this 36 year stretch in the Nanaimo riding, the Cowichan-Newcastle riding to the south had a different tradition. As mentioned, Sam Guthrie represented the riding from 1920-1924 then as a CCF MLA from 1937-1949. Guthrie lost to Conservatives in 1924 and 1928, and in 1933, lost to an Independent Conservative, Hugh Savage. This is a footnote of history as Savage was backed by an organization called the OGM or Oxford Group Movement, noted in BC’s Electoral History 1871-1986. Guthrie’s final campaign was also in 1949, losing not by a whisker, but to Andrew Whisker, a Coalition candidate. By my count, Guthrie made it to the ballot 8 times, winning half the time. During this time of Liberal wins in Nanaimo, it seems strange that the fledgling CCF did not gain a foothold in the city that spawned Socialist MLAs during the Conservative floodwaters of the McBride era. The CCF’s first contested election was 1933 and it served as BC’s Official Opposition between 1933-1937, and from 1941-1952 during the Coalition years. Yet, the CCF could not win in Nanaimo. Even a young accountant named Dave Stupich could not pull it off in 1949, losing to George Pearson. It turns out the ‘NDP town’ was never a ‘CCF town’. Not at all. Given the ProRep referendum, you can wonder why anyone from the NDP would support electoral reform when you look at the sad tale of 1952. Quick history lesson: Coalition government rigs the rules thinking that by giving voters a second and third choice, this will be good for Liberals and Conservatives, who were back to contesting elections under their own labels in 1952. You see, they wanted to gang up and stop Harold Winch’s CCF at any cost. Then, along came the Socreds. When the first preference votes were counted in the 1952 election, Winch’s CCF led in 21 seats to the Social Credit’s 14, in the 48 seats Legislature. A clear win. The Social Credit had never fully contested a BC election before. The Liberals and Conservatives were eclipsed by populist alternatives. However, this time, the election wasn’t over at the first count. In Nanaimo and the Islands, as it was then called, Stupich held a 369 vote lead over Progressive Conservative Dr. Larry Giovando. However, when the Liberal was dropped from the ballot, Stupich’s lead melted away and Giovando won by a margin of 5,144 to 4,581. Not only did this delay Stupich’s political career, it had an enormous impact on BC. This was one of three seats that slipped away from the CCF while the Social Credit gained five seats through successive counts. The final count was 19 Social Credit, 18 CCF, with the rest split between the Liberals, Conservatives, and an Independent Labour MLA (who was not partial to joining with the CCF). Paddy Sherman’s Bennett describes the machinations that followed. The Socreds did not even have a leader during the 1952 election. W.A.C. Bennett was elected leader by a vote of the new caucus afterward. Bennett then jousted with the Lieutenant-Governor and gained power, against the strenuous objections of CCF leader Harold Winch. I wrote this all up in a previous blog post: “History tells us, be careful what you wish for”. But for one seat, the CCF would have likely been invited to govern, especially when they had won the popular vote by a significant margin. Then in 1953, it happened again to Stupich! Stupich had a big lead on the first count, with Socred Earle Westwood second, and Giovando third. Clearly the Liberal voters preferred Giovando to Stupich because he vaulted to second and then edged Stupich by 18 votes on the final count. Robbed again! The Socreds won a majority in the Legislature this time. The Progressive Conservatives were reduced to one seat – Giovando. You have to think Stupich was quite delighted to see W.A.C. Bennett scrap the preferential balloting system and go back to first-past-the-post. Dr. Larry Giovando was a well-respected physician in Nanaimo. In the Legislature, he doubtlessly had a lonely time as the sole Progressive Conservative. He assailed W.A.C. over “fancy bookkeeping”, though Sherman notes that Giovando would leave the PC’s “in a huff”. 1952 also saw the election in Cowichan-Newcastle of Robert (Bob) Strachan. He held the seat, and variations of it, until 1975. He was the longest serving Opposition leader in BC history (1956-1969). He left politics in 1975 for an appointment as BC’s Agent-General in London. Like many trade unionists, he had emigrated from Scotland and found his way to resource communities in BC, where he would rise to be a union leader. He had a long tenure in Opposition, where he endured four straight general election defeats. He was the basketball equivalent of the Washington Generals to W.A.C’s Harlem Globetrotters. But Strachan hung in there for a term in government under Premier Dave Barrett, and was Minister responsible for the creation of ICBC. Now that first-past-the-post was back in play, it should have been time for the CCF to prevail in Nanaimo. After all, they were winning elsewhere on the Island. It turns out that Nanaimo continued to be a free enterprise paradise. Social Credit’s Earle Westwood, who lost in 1953, prevailed over Stupich in 1956 and 1960. These marked Stupich’s fourth and fifth losses to start out his political career. In 1960, the CCF won 16 seats in BC but they could not crack Nanaimo. In that campaign, Nanaimo lawyer Ted Strongitharm ran for the Progressive Conservatives. His son, Bruce, was a longtime Chief of Staff to the BC Forests minister, and showed me the campaign brochure where his Dad promised to build a pedestrian bridge to Newcastle Island. Now, there’s an idea! Strongitharm would mentor a young lawyer at his law firm – Leonard Krog. During the 1950s and the 1960s, the Liberals and the Progressive Conservatives tried to revive their fortunes. How long could this Social Credit Party last, anyways, before people returned to the old brands? The Progressive Conservative leader for three of those elections, Deane Finlayson, was from Nanaimo, though he didn’t contest seats there. Finlayson was a 33-year old Nanaimo insurance agent, who had managed Giovando’s successful 1952 campaign, when he became leader prior to the 1953 election. The Party was desperate to dump outgoing leader Herbert Anscomb and after party heavyweights like George Pearkes declined, the youthful Finlayson stepped up. He ran in Oak Bay in 1953, a by-election in Victoria in 1953, and in North Vancouver in 1956 and 1960, as leader. The results were dismal, though the assessment of Finlayson has always been sterling. He had a reputation for honest speech, was commended for his WWII service in the RCAF, and had a lifetime of community service. In business, he developed the Island’s largest mall, Woodgrove, and built much of Hammond Bay, in the Nanaimo riding. In the process of adding Finlayson to this post (which was a terrible oversight), I found a thesis outlining the demise of the Progressive Conservatives: From Rule to Ruin, for you political junkies out there). Finlayson’s biography is here. Like many Socreds of that age, Earle Westwood was a small businessman and local leader. A funeral home operator, Mayor of Nanaimo, and School Board Chair. He served in cabinet under W.A.C. in ministries such as Trade and Industry, Commercial Transport, and Recreation and Conservation. He was from a pioneering Nanaimo family. Finally, in 1963, under the banner of the NDP, Dave Stupich wins. Avenging his near losses, he edged Earle Westwood by 18 votes. It wouldn’t get much easier for Stupich in the short-term. Enter the Pirate. At the time of the 1966 election, Frank Ney was a Notary and co-owner of Nanaimo Realty. He had already been involved in countless community initiatives. I’m not sure when it started, but he is renown for dressing up as a pirate. (He would also chair the committee in 1967 that led to Nanaimo’s world famous bathtub races). He replaced Westwood as the Social Credit standard bearer and took on Dave Stupich. As often happens in politics, the luck evens out. Stupich won another nail-biter, this time by 45 votes. votes and went on to serve as both mayor and MLA concurrently. The Liberal in the 1969 race netted 722 votes. Did he play a role in defeating Dave Stupich? I don’t know, you would have to ask him. That young whippersnapper’s name is Bob Plecas. 50 years later and he’s still causing a ruckus in BC politics. So, to recap the amazing political success of the lefties in the main Nanaimo riding, between World War I and 1970, lefties (ie. Dave Stupich alone) won two out of 16 elections. They did much better in the southern Cowichan-Newcastle riding, winning almost all of the time, but in the main Nanaimo riding, it was hardly the Socialist stronghold that it had once been in the early 1900s. At that point, the screen goes dark for free enterprisers. Sporting a .250 batting average heading into the 1972 campaign, Stupich had Ney walk the plank, winning by 4000 votes, joining in the tide that swept in BC’s first NDP government. The Pirate carried on as mayor, serving 21 years in total. Interesting account of Stupich and the creation of ALR, and an overall good read. Stupich was quick out of the gates and announced that legislation to protect farmland and compensate farmers would be ready for a fall session in 1972. Says Meggs/Mickleburgh, “Stupich not only failed to seek a cost analysis of the compensation pledge – an astonishing oversight for an accountant – but began to execute a deliberate strategy of public statements designed to lock Barrett and the cabinet into a compensation plan before either had a chance to review the bill.” It was a daring or reckless move by Stupich, depending on your view. Stupich made an “extraordinary keynote” to farmers that fall stating, “My advice to developers right now is not to gamble by investing their money in farmland.” Stupich asserted that a freeze had been put on rezoning agricultural land (which was not true). His comments triggered a province-wide rush to rezone. On December 21, with Barrett out of town, an “angry cabinet” was convinced by Stupich to freeze the sale of all agricultural land until further notice. Continuing to borrow from Meggs and Mickleburgh’s account, NDP heavyweight Bob Williams later described the ordeal as a “tough, bitter battle” to rein in Stupich. The internal debate revolved around compensation, while the external debate was plunging the new government into major controversy. The end result was the Agricultural Land Reserve (ALR), an enduring legacy of the Barrett government. By 1975, the ALR had been implemented which Meggs/Mickleburgh say did much to restore Stupich’s reputation as a policy-maker. 1975 was a year of great change in BC politics. The Social Credit Party was in a revival led by the younger Bill Bennett with Grace McCarthy barnstorming among the grassroots. Polarization intensified and ‘fear of the NDP’ drove moderates into the arms of the Socreds. Three Liberal MLAs joined Bennett’s team along with one Progressive Conservative MLA, and, ultimately, one NDP MLA too. The drumbeat became louder for a ‘snap election’ to catch the opposition off guard. In fall 1975, Barrett readied his team and shuffled his cabinet. Stupich was appointed Minister of Finance. The snap election was called, but when the votes were counted in December, the Barrett government had been trounced. Stupich won with a reduced margin, defeating future Nanaimo mayor Graeme Roberts. The loss was devastating for the NDP, but it cannot be said that they coasted during their term in government. They had a very active and aggressive agenda, which was halted abruptly when they were defeated. Dave Barrett lost his seat and plans were made to return him to the Legislature. Vancouver East MLA Bob Williams agreed to step aside, with Stupich playing a key role, arranging financing to cover off Barrett while he was out of a job, and to help compensate Bob Williams after he had resigned. How? Through the Nanaimo Commonwealth Holdings Society (NCHS). The NCHS was a Nanaimo institution that was built on bingo proceeds. Stupich, an accountant, engineered it into a political fund that supported NDP. It operated like a parallel political fund to the NDP itself. Rod Mickleburgh described its purpose in a Globe & Mail article (2000)reporting on the testimony of Dave Barrett, where it was used for many purposes such as Williams’ compensation, funding political activity, Barrett’s federal leadership campaign, and Stupich’s leadership campaign. The NCHS mess would not catch up with Stupich until much later. Stupich consolidated his hold on the riding with smashing wins in 1979 (5,000 votes) and 1983 (4,000 votes). It was a time of ever-increasing polarization as the third and fourth place parties (Liberals and PCs) melted away with voters essentially being forced to pick sides between the NDP and Socreds. In Nanaimo, most chose the NDP. What are the reasons for Nanaimo being a competitive playing field in the 1960s compared to being an NDP stronghold in 1970s and beyond? Was it demographics? Riding boundary changes? Sophisticated organizing and party machinery? Social Credit alienating labour? All of the above? Liberal Ray Perrault. Around the time, Nanaimo’s NDP MP Colin Cameron died in office. Douglas won the byelection and served until 1979 when he retired. He was voted “The Greatest Canadian” in a CBC competition and is often called the “Father of Medicare”. Regardless of one’s views, he is a leader that was held in high regard by other parties, and revered in his own. Some years later, when I was campaigning for Bob Rae’s bid to be Liberal leader, I asked former Nanaimo NDP MP Ted Miller if he would support Bob, who he served with in the House of Commons. Though Ted’s wonderful wife Patti was a strong supporter of Bob’s, Ted told me, “I can’t do it to Tommy”. Such was his respect for the man. During Stupich’s fifth term of office, Dave Barrett resigned as NDP leader. He had lost his third successive rematch to Bill Bennett and it was time to go. A wide-open NDP leadership race broke out and Dave Stupich jumped in as a candidate. The party broker and backroom financier was 63 years old and representative of a bygone era in the NDP. He was not the default ‘establishment candidate’ nor was he ‘change’. He placed fifth on the first ballot and fourth on the second, far behind the leaders. He was eliminated on the third ballot, and watched the Party crown Port Alberni’s Bob Skelly, a compromise choice it would soon regret. Stupich continued on as NDP candidate in the 1986 election. Nanaimo had become a 2-member seat. Malaspina College professor Dale Lovick joined the ticket and the two of them easily prevailed in an election that saw Socred Bill Vander Zalm romp to victory over Skelly. This time, the NDP would acclaim Mike Harcourt as leader. Not long after, during a time of great optimism for the NDP’s federal chances, Stupich resigned his seat and ran federally, winning handily. The opportunity for the NDP did not pan out, but they did well in BC. A disappointed Broadbent resigned, with Stupich backing Dave Barrett’s federal leadership bid. He lost and the party leadership went to the unsteady hand of Audrey McLaughlin. The NDP would be reduced to a small rump group in 1993 and Stupich would lose his seat to the Reform Party’s Bob Ringma. At age 72, he had been retired from elected office. Stupich’s exit from provincial politics created a 1989 byelection to replace him. The NDP put forward Jan Pullinger, a relatively unknown candidate then. The Socreds could not have landed a better candidate – Larry McNabb, a popular former coach of the Nanaimo Clippers, and a former pro hockey player in the Western Hockey League. McNabb was tough as nails. Don Cherry (“Grapes”) recalled fighting McNabb. The Cow Palace in San Francisco had a banner stating, “Larry McNabb: Heavyweight Champion of the WHL”. The two paired off and McNabb broke his hand on Cherry’s head. Cherry recounts it here. However, on the streets of Nanaimo, McNabb was no match for the NDP, especially when he was weighed down by Premier Bill Vander Zalm’s unpopularity. Pullinger knocked out McNabb and served twelve years in office, including various posts in Cabinet. She and Dale Lovick married during that time, and were a political power couple in the Nanaimo area. It was during Stupich’s federal term of office, 1988-1993, that the NCHS scandal reared its head. Mike Harcourt had led the NDP to power in BC in 1991 with a strong majority government. In 1992, a whistleblower by the name of Jacques Carpentier went to the Nanaimo RCMP with his concerns about the misuse of charitable money by the NCHS. As the story unfolded, the scandal engulfed the NDP. Stupich had been at the heart of the party for a long time, and it seemed that he had solved a lot of NDP problems with available cash. A forensic audit was ordered which was a political disaster. The Harcourt government flailed in the controversy, with Opposition Leader Gordon Campbell leading the charge along with a press gallery that was generating headlines. In 1995, Harcourt, who had nothing really to do with the scandal, announced he would not run again. He took the fall. A leadership convention was called and Glen Clark was elected leader. Bingogate was erased from the headlines as Clark launched a blitzkrieg on the BC Liberals who had enjoyed a hefty lead in the polls. The political debate was reordered to traditional business-labour, class war themes, rather than scandal. In Nanaimo, Dale Lovick sought his third term in office amidst the controversy. He was closely aligned with Stupich. Nanaimo Mayor Gary Korpan ran for the BC Liberals. There was much optimism among the Liberals of storming the NDP bastion, but on election night, not only did Glen Clark win a majority government for the NDP, Nanaimo returned Lovick to the Legislature comfortably. The NCHS scandal deepened. Stupich was charged with 64 counts of theft, fraud, forgery, and breach of trust. He eventually would plead guilty and serve two years less a day under electronic monitoring. Such were the conflicted feelings that many in Nanaimo and throughout the NDP felt. From the time a 28-year old Stupich sought office in 1949 until 1993, he was a central figure in Nanaimo politics. He had friends across the spectrum. He was a regional ‘boss’ like few others in the province. During his time, Nanaimo became an ‘NDP town’. It came crashing down on Stupich, but the NDP barely missed a beat. Dale Lovick served until 2001. He was regarded as one of the most talented NDP backbenchers. NCHS probably held him back during the Harcourt years. He became Speaker in 1996 then was appointed to Cabinet in 1998. He was quick-witted in the House, a good debater, and never had to sweat during his three election wins. In 1991, riding boundaries changed and a considerable chunk of North Nanaimo was included in the Parksville-Qualicum riding. Nanaimo lawyer Leonard Krog ran for the NDP, sweeping to victory as part of the Harcourt win. In reality, the opposition to the NDP was split in that riding between a disorganized BC Liberal campaign and the dying Socreds. Krog served in the backbench, along with Lovick, and Pullinger. The central Island did not make the cut in the Harcourt cabinet. In 1996, five-term Parksville mayor Paul Reitsma won the BC Liberal nomination and edged Krog by 483 votes, winning the only seat for the Liberals north of Victoria on Vancouver Island. Reitmsa scrapped with regional NDP politicians in local newspapers. At some point, he had the not-so-bright idea to write phony letters to the editor under the pen name of “Warren Betanko”, a name that will live on forever. When the Parksville newspaper broke the news that its MLA was forging letters, Reitsma was on the run. The morning the story hit, I talked to his constituency assistant. “Will probably blow over”, I said. By noon, Reitsma was out of the Liberal Caucus. Citizens across the spectrum rallied to form a recall campaign. Over 60 days, Reitsma felt the heat. Rather than be the first MLA in Canadian history to be recalled, he resigned. The NDP probably saw this an opportunity to win back Krog’s seat, and he was convinced to run. Krog had a reputation in his first term as being a bit more outspoken than your average backbench MLA. He was their best shot. However, the Glen Clark government was becoming very unpopular as the economy struggled and a litany of scandals and controversies plagued them. Meanwhile, Gordon Campbell and the BC Liberals were getting their act together. Just like 1975, the non-NDP public was starting to pull together behind one party. Seven candidates vied for the nomination and on a Saturday afternoon, close to 1000 people jammed Dover Bay Secondary to elect Judith Reid over a host of more experienced candidates. Reid was a shellfish farmer from Deep Bay in the north end of the riding. No elected experience, she was an unconventional choice. She was an independent in BC Liberal clothing, which worked to her advantage. While Krog could demonstrate his superior knowledge on policies at that point, Reid won the community with her earnestness, and a deeply held view to not elect the NDP. Reid trounced Krog 53% to 23%. The result was a declarative statement on the true state of the NDP’s political fortunes. Less than a year later, Glen Clark was out of office. In 2001, BC voters spanked the NDP hard, with Campbell’s Liberals winning 77 of 79 seats, including all 13 on Vancouver Island. Reid had a massive win in Parksville-Qualicum-North Nanaimo (57%), while political newcomer Mike Hunter, a fisheries executive who had recently moved to Nanaimo, defeated Krog in what was seen as a safe NDP seat. Reid was made Minister of Transportation and served until 2004. During her time, she oversaw the sale of BC Rail, which became a political firestorm. Though the controversy, and resulting investigations, did not touch Reid, she decided not to run again in 2005. She was exited from Cabinet to make way for new blood that would be running for re-election. Hunter served his term in the backbench and was seen as a strong constituency MLA. But by 2005, the NDP had roared back to life. New leader Carole James put a new face on the troubled brand and gave Campbell a run for the money. While the Campbell Liberals were re-elected, the Nanaimo riding returned to the NDP fold with Krog winning the rematch with Hunter 52% to 34%. In the Parksville-North Nanaimo seat, Nanaimo Councillor Ron Cantelon succeeded Reid as BC Liberal MLA. Cantelon and Krog were both easily re-elected in 2009. By this time, a chunk of south Nanaimo was added to the north end of the Cowichan Valley, becoming a strong NDP riding with Doug Routley as MLA. Cantelon was instrumental in coordinating provincial funding for Nanaimo area projects like airport expansion, the creation of Vancouver Island University, and funding for the port and convention centre. In the 2000s, North Nanaimo was becoming as much of a political base of the BC Liberals as South Nanaimo is for the NDP, thanks in no small part to their relentless organizer Jack Doan. After serving a stint in cabinet as Minister of Agriculture, and as caucus chair, Cantelon retired in 2013 clearing the way for a prized recruit for Christy Clark – Michelle Stilwell. A paralympian multiple gold medallist for Canada, Stilwell presented a young, energizing face for a party that needed to show a new look. Stilwell became part of a narrative that helped propel Christy Clark to her 2013 election victory. 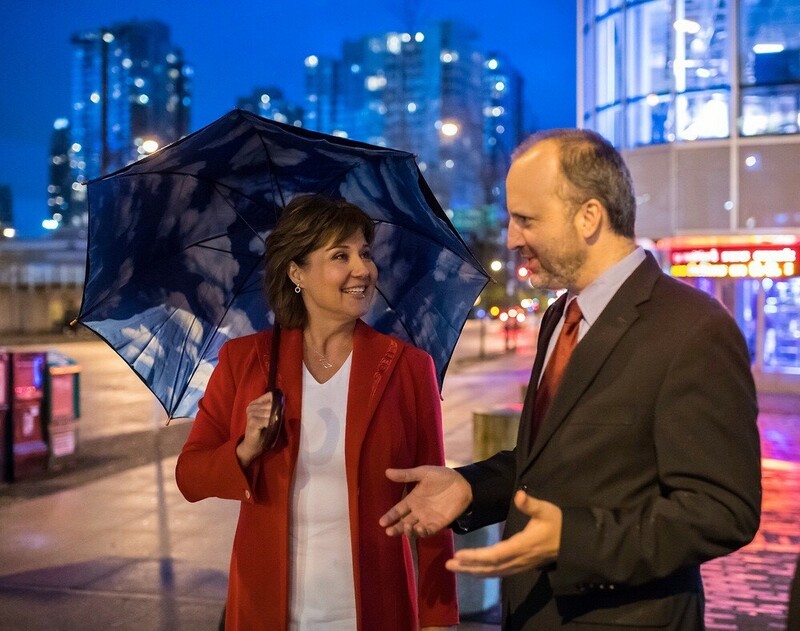 Starting off as caucus chair, Stilwell joined the cabinet as Minister of Social Development and Social Innovation, winning re-election in 2017 – the last remaining BC Liberal MLA on the Island. Krog had a surprisingly tighter margin in 2013. Then running the BC Liberal provincial campaign, I can attest to the fact that we simply could not find a candidate in Nanaimo to contest Krog, or the riding to the south. They were the 84thand 85thout of 85 ridings to confirm candidates. Once he joined the race during the writ period, former Nanaimo Chamber of Commerce president Walter Anderson put forward a good showing narrowing the margin to nine points. Pretty good despite few resources and no lead-up time. Had we had our act together, we might have been able to win in 2013. In 2017, Krog’s margin widened again in a campaign that saw the BC Liberals running against the tide. Following the turnover in government in July 2017, Krog was left out of John Horgan’s cabinet. At that time, Krog had 17 years of experience in the Legislature and had served as Attorney-General critic. There were lots of other cabinet contenders on the Island and his gender worked against his chances too. Some say his lack of enthusiasm for the leadership of Carole James, which had split the caucus years earlier, may have been a factor. Whatever the reason, Krog was out. The logical conclusion was that he would become Speaker in a very contentious situation. However, the unexpected elevation of Darryl Plecas to that role closed off that option. Krog stayed on the backbench. In 2018, as we all know now, Krog announced he would seek the mayor’s chair in Nanaimo. My previous blog post on the Nanaimo byelection discussed Krog’s surprising decision. Surprising because of the razor thin governing majority for the NDP and that it would be a Nanaimo MLA – of all things – that would put the government’s survival on the line by resigning. He’s mayor now and the byelection is on. Krog’s batting average as candidate for MLA is .625 – five wins, three losses. Not too shabby. The span of his provincial political career is up there with Stupich, Pearson, Strachan, Guthrie, Williams, and Hawthornthwaite. Though his most important work may be ahead of him at Nanaimo City Hall, a task for which he was fully supported by his potential successor, BC Liberal byelection candidate Tony Harris. Krog won big for mayor, over a strong candidate too. Why has Krog been popular? I would argue that he has always stayed close to the community and approachable, with his integrity never in question. Tough act to replace. This historical stroll through Nanaimo’s political history has been surprising to me, a political nut who lived in the area for fifteen years. My research, which was a full-scale mobilization of underappreciated works on my bookshelves, exposed my ignorance regarding vast parts of Nanaimo’s and our province’s history. While excessively long, this blog post actually gives short shrift to major events that defined the city, such as the activism around the coal mines, and also the development of a strong small business community that paralleled the strength of the unions for much of Nanaimo’s history. Happily, there are some great books and articles on these topics that deserve a lot of attention. What can be said about Nanaimo is that it has been populated by some real originals from all parts of the spectrum. Nanaimo politicians have often spoken their minds over the years. They’ve had their elbows up and they have strived to make their mark. Is Nanaimo an NDP town? Demographically, it shouldn’t be a slam dunk, but tradition over the past 50+ years has been powerful. Stupich helped build the tradition, while Lovick and Krog consolidated the party’s hold. Since the NDP was formed, it has won 13 of 15 times in the core Nanaimo seat. It’s also a matter of boundaries – shift that riding to the north, and drop a little to the south, and the NDP loses its advantage. Nanaimo’s history plays out to this day on a north-south axis. As much as Nanaimo grows and changes, the coal still lies beneath the surface. Nanaimo’s politics run deep. The byelection gives voters a chance to consider Nanaimo’s identity. Will they go with a candidate that speaks to a tradition of independence, or stay with a party that it has loyally backed? The wildcard – the Green candidate, the Pirate’s daughter– presents an option to take the tradition in an entirely new direction. Some advice. Whoever does become the MLA, keep an eye on your spectacles. Adding feedback from Bruce Strongitharm, who’s father Ted Strongitharm ran for the Progressive Conservatives in 1960. I remember the election as if I was 13, oh wait I was 13. My dad’s big race was against the Liberal candidate Hugh Heath ( his wife later became a liberal senator) because everyone new either the Social Credit or CCF were going to win. Alas Heath won the mini race. I had fun though. My dad would take a van with a speaker on top and stop at a residential street corner and do his campaign speech followed by door knocking. Wasn’t always well received. The leader of the Conservatives then was my dad’s good friend Deane Finlayson (my younger brother is named after him) also lived in Nanaimo but ran in North Vancouver I think. He didn’t win either. The bridge is still a good idea. There major item on the brochure that Mike left out was “getting rid of the one man rule”. November 21st marks 30 years since the most consequential election in a generation – the 1988 federal election. This rematch of 1984 was remarkable for its substance, its strategies, and its aftermath. It demonstrated that campaigns matter, with huge momentum shifts and gutsy, dramatic performances by John Turner and Brian Mulroney. It was an election that pivoted on Canada’s image of itself in relation to the United States and drew 76% of voters to the polls. Not only did the election decide Canada’s course on free trade, it represented the climax of the Mulroney era. No Conservative government had won back-to-back majorities since John A. Macdonald in 1891. Despite this moment of triumph, five years later the Progressive Conservative Party would be a smoldering ruin, its grand coalition (Quebec-Alberta Bridge) ravaged by regional alienation and Quebec nationalism. It was the first general election where I was able to take a peek in the campaign cockpit. It was an election I will never forget. Like no other campaign in the past 30 years, it revolved around one major issue- Free Trade. Canada had signed a Free Trade Agreement with the United States. At that time, there was a much stronger sense of Canadian economic nationalism than there is today. Already a prominent issue, Free Trade dominated the agenda when Liberal leader John Turner instructed Liberal senators to block Free Trade legislation. The Liberals had a majority in the Senate. The Mulroney government was powerless to pass Free Trade without Senate approval. Turner had forced Free Trade as the defining issue of the election. The other centerpiece of Mulroney’s agenda was the Meech Lake Accord. In 1987, Mulroney secured the approval of all ten premiers for a package of constitutional reforms that would bring Québec ‘into the Constitution’. The most contentious aspect was recognition of Quebec as a “distinct society”. Many critiques complained about its decentralizing power. It became a very controversial issue among elites (particularly liberal elites) and discontentment grew, especially in Western Canada. John Duffy’s excellent book, Fights of Our Lives, outlines the political strategies used in the 1988 campaign – he named 1988 as one of the five top campaigns in Canadian history. The Mulroney campaign started off in a bubble – a frontrunner campaign. After three years of scandal in his first term, Mulroney had righted the ship, in part because Free Trade provided him with a proof point of his leadership traits and economic agenda. The Liberals were internally divided and Ed Broadbent’s NDP were threatening to vault into second place. It seemed that Mulroney just had to play it safe, but that was hard to do in what was a seven-week campaign. John Turner had his back to the wall. He had embraced the Free Trade issue and took some control of the agenda through the Senate gambit. He had public backing for his position: “Let the people decide”. However, by the time the election was called on October 1st, the Liberals were sagging in the polls. The Meech Lake Accord had badly divided them, while Free Trade also exposed a major rift. As Duffy writes, Turner supported Meech Lake for Quebec, and opposed Free Trade for English Canada. That was the bargain. In the first two weeks of the campaign, Peter Mansbridge breathlessly reported that there was a push within the Liberals to replace Turner mid-campaign with Jean Chrétien, his leadership rival. Turner stared them down and held on for the national TV debates taking place October 24 and 25. NDP leader Ed Broadbent did not want a referendum on Free Trade. He wanted to talk about social issues and trust. He had successfully likened Mulroney and Turner as “Bay Street boys” in 1984, hurting Turner, and by 1988, there was also an aroma around Mulroney on trust. A Free Trade election would relegate Broadbent to the sidelines while Mulroney and Turner went mano a mano. Meanwhile, out in the hinterland, Preston Manning was recruiting candidates and running a slate of candidates in Western Canada. He was gaining notice in church basements and in rural areas, but not seen as a major threat. Mulroney, Turner, and Broadbent all supported Meech Lake. It did not become a vote-driving issue in the campaign. This all-party consensus would have far-reaching implications after the election. In 1988, campaigns could not advertise on TV until the time of the TV debates toward the end of October. The first few weeks were the ‘phony war’. It was the debates that changed everything, until they changed again. John Turner limped into the debates looking like a political dead man – metaphorically and physically. He was fighting immense back pain. In the French debate, he exceeded expectations and brought some fight. Ed Broadbent, with limited French skills, was peripheral. In the English debate, the fireworks came near the end. In 1984, Mulroney had destroyed Turner with a devastating attack on political patronage. In 1988, Turner assailed Mulroney on Free Trade, demonstrating considerable passion and conviction. As Duffy points out, Turner had been coached specifically on body language. While Mulroney returned Turner’s salvos, Turner was simply more convincing and authentic. As has been the case with highly-charged leaders’ debates, the full impact is not known until days or even a week later. The same-night judging is conducted in a vacuum. It’s not until news clips have been repeated endlessly, and water cooler discussions take place, that momentum truly forms. Within a week, the Liberals were on a big-time roll, galloping into the lead. The PCs were on their heels. At this point, there were three weeks to go. The Liberals also released one of the best TV ads ever produced in Canadian elections. It showed the Canada-US border being erased as part of Free Trade negotiations. As a Young Liberal working in the trenches in BC, the sense of momentum was palpable. Excitement flowed through the campaign. For the first time since John Turner was elected leader in 1984, there were real grounds for optimism. Turner had been a major star as a cabinet minister, but after his retreat to law, he had not thus far returned to form as leader. The debate was a major turning point for him. As Duffy chronicles, Mulroney held things together using his instincts while his strategists, like polling wizard Allan Gregg, crafted a new approach to deal with the Liberal insurgency. Ultimately, the PC campaign, which had lots of money, sent in the B52 bombers to pound the Liberal campaign, “bombing the bridge” of Turner’s credibility. The PCs had wisely agreed to TV debates well in advance of Election Day. This allowed them crucial time for a course correction. In provincial campaigns in BC in 1991 and 2013, and in Manitoba in 1988, TV debates that led to huge momentum changes occurred relatively close to voting and had big impacts. Mulroney’s forces turned back the Liberal tide. The campaign saw a gutsy charge by Turner, taking his opponents by surprise with his passionate opposition to the Free Trade Agreement. It also saw a skillful counterattack by Mulroney in the final weeks, restoring the PC’s advantage. Both campaigns showed initiative and resolve. The Liberals, weakened by years of infighting and the disastrous 1984 campaign, simply did not have the wherewithal to win. Mulroney held Québec for which he had a clear proposition – pro-Meech Lake and pro-Free Trade. He held the West, which also embraced Free Trade. The Quebec-Alberta Bridge of 1984 was kept in tact, but would soon crumble. Turner’s Liberals reclaimed some of their lost ground in English Canada, especially in Ontario. The Party, reduced to rubble in 1984, now had a much stronger caucus and a lot of new blood. Turner left the Liberals in better shape then he found them in 1984. The NDP had its best showing, in part because it did very well in British Columbia. Strategic voting against Free Trade in BC meant voting NDP instead of the Liberals. Overall, the results were a disappointment for Ed Broadbent in his fourth campaign as leader. With a majority in hand, the Senate relented, and Free Trade was passed. In the 1990s, it would morph into NAFTA. As a national policy, it has stood the test of time. The re-election of the Mulroney PCs also led to the introduction of the GST. The GST had as much or more to do with its ultimate demise than anything. But again, it’s a policy that has stood the test of time. No government will get rid of the GST. Has there been an election since Confederation that led to two foundational blocks of our national economy like 1988? Despite the all-party consensus over Meech Lake, the consensus would break down as new premiers were elected. Liberal Frank McKenna expressed his doubts. A minority government in Manitoba in 1988 forced PC Premier Gary Filmon to take hard line, in step with his opposition leader Liberal Sharon Carstairs. Then Clyde Wells was elected as Premier of Newfoundland, the staunchest critic among the premiers. Preston Manning and the Reform Party were a gathering storm in Western Canada. With Free Trade settled, westerners turned their attention to a constitutional deal that went against their grain. In 1990, the Meech Lake Accord fell apart in a final desperate week to salvage it. Regional forces were unleashed that blew up the PC’s Quebec-Alberta Bridge. Brian Mulroney’s star recruit in Quebec in 1988, Lucien Bouchard, spectacularly resigned and formed the Bloc Quebecois, later leading the Oui forces in the 1995 Quebec referendum. Mulroney would try again in 1992 with the Charlottetown Accord which was put to national referendum. Everyone was in favour of it, except the people. Lucien Bouchard’s Bloc Quebecois and Preston Manning’s Reform Party would be the 2nd and 3rd parties in the House of Commons after 1993. Kim Campbell became the first female prime minister, and first home-grown British Columbian to be PM, and went down to a historically brutal defeat. A mere five years after its climactic victory, the PCs had virtually been wiped out, reduced to two seats. They would limp along until merging with the Reform Party’s successor, the Canadian Alliance. In effect, the Canadian Alliance conducted a reverse takeover of this venerable national party. Jean Chrétien won the first of three successive majority governments, based largely on an Ontario vote split caused by Meech Lake and the GST. The aftermath of 1988 also had a huge impact on Canada’s aboriginal peoples. As Meech Lake reached its final moment, Manitoba MLA Elijah Harper blocked approval in the Manitoba legislature. Harper’s act of defiance put aboriginal issues front and centre on the constitutional agenda. What would have happened if John Turner had won in 1988? He would have had a huge challenge holding his government together on Meech Lake. Is it possible that Turner could have resolved the impasse with Liberal Premier Clyde Wells. Unlikely, but it’s possible. Mulroney was unsuccessful, but Turner would have had a shot. Turner would have had a very difficult road ahead in re-negotiating or walking away from the Free Trade deal. He would have faced blistering opposition from the Canadian business community. It’s unlikely the Liberals, given these challenges, would have had the courage to bring forward a value added tax, like the GST on the same timetable as the Mulroney government. The PCs would not have been decimated in 1993. Had they lost in 1988, they would have had a strong opposition. Perhaps a new leader would have taken over, or Mulroney would have stayed to fight another day. Would we have seen Jean Chrétien as prime minister? Probably not. He would have been on the outside looking in while Turner governed. Campaigns matter. They change the course of our country, provinces, and communities. And no campaign in recent times changed the course of Canada like 1988. Fights of Our Lives is an outstanding (and fun) analysis of election campaigns in Canada since Confederation. John Duffy pulled off an epic volume. My only complaint is that he hasn’t updated it! Letting the People Decide. A scholarly analysis of the 1988 election by UBC Professor Richard Johnston and other academics. It takes a deep dive into (credible) polling data. Elusive Destiny. Paul Litt’s book on John Turner’s political career. Strong recommendation. Once upon a time, I was a teenage vote-splitter. I was that kid who nerded out on politics. I joined the Liberal Party at its nadir, when it had zero seats provincially in British Columbia. I could have joined one of the big parties, but I felt at home with the smaller, and not yet even fledgling Liberals. I went to my first party convention in 1985. The leader of the BC Liberal Party was Art Lee, the first Chinese-Canadian leader in BC history. The BC Liberals were coming off an election where they received 3% of the vote and had no seats. This was a refrain from many Liberals turned Socred who understood that a ‘coalition’ was the best way to win against the NDP. Notwithstanding Austy’s tutelage, I continued with the Liberals and we received 7% in the 1986 election and zero seats. Art Lee moved on and we needed a new leader. Gordon Wilson volunteered and was acclaimed on Halloween day 1987. No seats, no money, and not much more than that. We encountered setback after setback. Yet, Wilson, and a core group, never stopped fighting and kept the party afloat. The Social Credit Party under Bill Vander Zalm was self-destructing and the NDP were, well, the NDP. Through my university years, I continued to hope for a Liberal breakthrough. In 1991, we ran (close to) a full slate of candidates and protested our way on to the Leaders’ Television debate. In one brief moment in that debate, Gordon Wilson crystallized the mood of the voters when, pointing at rival Social Credit and NDP leaders, he said, “Here’s a classic example of why nothing ever gets done in the province of British Columbia.” Wilson and the Liberals went from zero seats to form the Official Opposition and take 33% of the vote. The BC Liberals would ultimately reshape itself into an electoral coalition that would win four majority governments from 2001 to 2013 and win a plurality of seats in 2017. We didn’t need proportional representation to succeed. We started with nothing. We did it by growing, inviting, including, and responding to the voters. As you may have guessed, I’m voting to keep First-Past-the-Post (FPTP) and reject the cooked-up Proportional Representation (PR) scheme being pushed by the GreenDP. Never once, when I was a teenage vote-splitter, did I feel the need to question the validity of first-past-the-post. It was frustrating, as a third party, to fight against the vote-splitting argument. However, we saw a pathway because we wanted to be a big-tent party. We worked hard. We earned it. We didn’t ask for political charity. This is good for our electoral system. Unlike the United States, we have a dynamic party system. We are not bolted to a two-party dynamic that will never change. We have a tradition of protest parties that evolve into mainstream parties. We have also seen fit to relegate some parties to the dustbin of history. This is good for change and renewal. Under FPTP, the BC Social Credit dropped from 36 years in power to a third-place finish in 1991 to virtual extinction. Had we had PR, the Socreds would likely still exist. Maybe some would say, “Great!” But I would say that that party had its day, and it was time to start afresh with something modern. ‘Firing’ a political party introduces a different set of leaders and provides opportunity for young people and new voices. Across Canada, what’s become of the Union Nationale, the United Farmers of Alberta, the Alberta Social Credit, and the Saskatchewan PCs? These once-dominant parties also went into a period of decay then disappearance. PR would have kept them on life support, delaying change and renewal. Under FPTP in Canada, there is a natural evolution of protest parties too. When mainstream parties falter, upstart parties emerge. The Progressive Party fused with the Conservatives to form the Progressive Conservatives, a venerable national party for over half a century. When the Reform Party emerged due to western alienation and a post-GST populist uprising, it begat the Canadian Alliance, which joined forces with the PCs into today’s Conservative Party, which governed from 2006 to 2015. Again, this is dynamic activity that is responsive to voters’ desire for change. Our system allows for this fluidity and change. With PR, we would see a stagnating stasis, with tired parties blocking real change, and fringe parties emboldened to chip away at the margins. In FPTP, political parties are always changing. Some die, some return and renew, others start small and go big. Look at Prince Edward Island – the Greens may form the next government. That’s happening under FPTP. FPTP incents parties to stretch, grow, appeal to a wider audience, and build a bigger coalition. Isn’t this what we want – parties that are as reflective and as representative of as many voters as possible? To gain upwards of 40% of the vote is a major accomplishment that shows the breadth of a party’s support. We should want parties to be big. Why would we want small parties to be rewarded for taking a small sliver of the population? That does nothing to encourage common ground. Governing means implementing change. Through our history, there have been many minority governments, especially at the federal level – in the past 60 years, Stephen Harper, Paul Martin, Joe Clark, Pierre Trudeau, Lester Pearson, and John Diefenbaker all led minority governments. That takes place within FPTP and, usually, for a term or two, they govern. It’s good for the system that we have occasional minority governments. It’s part of the dynamism of our system. Ultimately, voters return to majority governments. Majority governments, in a country as vast as ours (and a province as diverse as ours), allow governments to be decisive. Parties campaign on a platform, then are accountable for delivering results. They have a strong hand, but they are tempered by many factors such as public opinion, media scrutiny, internal pressures such as the government caucus – and the fact that some governments actually do listen. In Canada, as in the UK and other Westminster systems, our government is accountable to parliament in the Legislature and in Question Period. Scrutiny at the provincial level in BC is much more intense than local government and more intense than corporate scrutiny. You are always being watched and held accountable. In the United States, there is no daily legislative scrutiny of the executive branch. Our system works better. When majority governments are elected, a strong hand allows for transformative change. Look at Dave Barrett’s NDP government from 1972 to 1975. Would a minority government or PR government implemented the ALR or ICBC? Probably not. Would a minority government or PR government have made the tough fiscal choices that Bill Bennett made in the early 1980s or Gordon Campbell and Christy Clark made? Too much horse-trading would result. The proof of the value of majority governments is when subsequent governments of a different stripe don’t change policies that they would not have otherwise brought in themselves. Instead of constant deal-making, I would rather have strong governments, regardless of ideology, give it their best shot and be held accountable. The best policies will survive. The bad policies will be changed. Under PR, we will see half-measures and we will see a lack of firmness. FPTP is not perfect. There are many flaws. I have seen them up close and personal. We could make many changes that would improve our system in terms of how legislatures work, how caucuses operate, and how voices are heard that do not require PR. The way to make these changes is through a public discussion and party reform, not through this sham process that will lack a legitimate outcome. Compared to the Citizens’ Assembly process, the NDP-Green government should truly be ashamed of themselves with the PR referendum. Isn’t it interesting that the largest majority government in BC history – the Gordon Campbell government – delivered a much-lauded electoral reform process, while the current minority government delivered this? As a teenage vote-splitter, I was told I would never make a difference. I worked on an impossible dream and, through commitment, hard work and a bit of luck, we succeeded. It was possible because our system enables both change and decisiveness. Get rid of the old, bring in the new. Renew yourself or get retired. Let’s let the dreamers dream and continue to try – some will make it. Christy Clark put her own stamp on the BC Liberals, earning her own mandate. Established parties can renew. And renew again. In my old age, I have fought off the vote-splitters. Push the mainstream parties to do better or perish. And let the little parties stay little until they get beyond their bubble and earn real power by appealing to a wider audience. It would have been a real drag as a teenage vote-splitter, and a lot less exciting, if instead of sparking real change, all we had sparked was a minor tweak that led to the continuation of the status quo. We don’t need an entrenched system as inflexible as the US system. Instead of asking what works in theory, let’s appreciate what is working in practice. After all, we live in a pretty great country, and a pretty great province. I had never heard of Leona Alleslev before she switched from red to blue. The Member of Parliament for Aurora-Oak Ridges-Richmond Hill becomes the latest in a long line of Canadian politicians who have crossed the floor to sit with a different political party than the one they were elected with. Most of the time, the end is nigh for that politician. Some are pushed by desperation. Some are motivated by pique. Others for genuine policy and ideological reasons. I’m not sure which category Alleslev belongs to. Unlike some examples, it was not expected, it was not a public journey, and she didn’t lay any track or provide signals. Thus, it’s fair comment to point out that she seemed like a happy Liberal not that long ago. Floor crossing is older than Canada itself. Wikipedia informs us that, in 1866, an anti-Confederate politician in New Brunswick switched sides when he did not receive a desired cabinet post. We could go back to WWI when many Liberal MPs left Wilfred Laurier and joined with the Unionist government under Robert Borden. Or to 1935 when British Columbia’s H.H. Stevens bolted the Conservative barn to form the Reconstructionist Party. At times, a floor crossing can signal a sea change in politics. In the past few weeks, we saw Maxime Bernier jump out of Air Scheer without a parachute. The impact of this Xtreme floor crossing is yet to be known. Some floor crossings precipitate or reflect foundational change. Réne Lévesque leaving the Quebec Liberal Party in the 1960s to form the Parti Quebecois is one of the most momentous moves in Canadian political history. It led to the election of the first Péquiste government in 1976 and a referendum on sovereignty-association in 1980. Watch the documentary Champions to see Lévesque’s impact and his enduring rivalry with Pierre Trudeau. In 1990, Lucien Bouchard spectacularly left the Mulroney government after the collapse of the Meech Lake accord, forming the Bloc Quebecois, and taking other Quebec PC and Liberal MPs with him, including Liberal MP Jean Lapierre. Bouchard led the Oui forces to the brink of victory in 1995, and shortly thereafter became Premier of Quebec. The 1993 election saw the collapse of the Progressive Conservatives to two seats with Preston Manning’s Reform Party dominating Western Canada. After Jean Chretien continually swept up in Quebec, PC Senator Gerry St. Germain was one of the first to attempt to unify the Conservative parties and changed his allegiance in the Senate from PC to become the first Canadian Alliance senator in 2000. Later, eleven Canadian Alliance MPs left caucus to sit as the “DRC” – Democratic Representative Caucus when they couldn’t get along with Alliance leader Stockwell Day, and included some political heavyweights like the first Reform MP ever elected, Deb Grey. The DRCs would morph into a coalition with Joe Clark’s (second-coming) PC caucus: the PC-DRC. Ultimately, most everyone got back together under the leadership of Stephen Harper after new PC leader Peter Mackay agreed to merge the PCs with Stephen Harper’s Alliance. Harper became the leader of the new Conservative Party and held Paul Martin to a minority in 2004 before winning his own minority in 2006. (Joe didn’t cross, he stayed PC until the end). The key point is that floor crossing influenced the course of events between 2000 and 2004. Some floor crossings reflect the ebb and flow of political tides. Scott Brison was elected as a Progressive Conservative, but left when that party merged with the Alliance to form the modern-day Conservative Party. Brison is a senior Liberal cabinet minister today. One can argue that he represented a shift in Canadian politics where some Progressive Conservatives migrated to the Liberals. Many politicians, like Bob Rae and Ujjal Dosanjh, sat for one party, then came back to run for another party later, reflecting how they had migrated through the political spectrum. Provincially, MLAs in both the Saskatchewan PCs and Liberals crossed the floor to the new Saskatchewan Party in 1997, which has governed the province since 2007. The PCs were extinguished and the Liberals are in the wilderness. In 2002, Yukon NDP MLA Dennis Fentie left his party to join the Yukon Party. A month later he was leader and later that year he became Premier, serving until 2011. BC has had three significant floor-crossings that led to a restructuring of political support bases. Leading up to the 1952 election, Conservative MLA WAC Bennett left that party and migrated toward to the Social Credit Party. The leaderless party won the plurality of seats in 1952 and Bennett became its leader (and, ultimately, Premier) after the election. Bennett governed for 20 years. Then following his defeat in 1972, his son Bill Bennett, the new leader, recruited former Liberal leader and MLA Dr. Pat McGeer, Allan Williams, and Garde Gardom to join the Socreds, along with PC MLA Hugh Curtis. All four floor crossers would play major roles in Bennett’s government, which lasted 11 years. He also attracted former Liberal leadership candidate Bill VanderZalm to run as a Socred in 1975 too. Then in the 1990s, there was a two-step process. First, four Social Credit MLAs left the former dynasty in ruins when they turned away from the fledgling BC Liberals under Gordon Campbell, to join the BC Reform Party in 1994. Their defection ultimately benefited the ruling NDP – Glen Clark would win a majority in 1996 while losing the popular vote. Campbell corralled the Reformers after 1996 and remaining Reform MLA Richard Neufeld crossed the floor to the BC Liberals, marking the formalization of a de facto coalition. Neufeld served as BC Liberal minister for seven years (now a senator) and the BC Liberals governed continuously for 16 years. Some floor crossings backfire spectacularly. Arguably, the WildRose defections to the ruling PC’s under Jim Prentice destroyed the political careers of those MLAs, like former leader Danielle Smith, and boomeranged on the Prentice government. It looked too cute, too orchestrated – the overdog overdoing it. Belinda Stronach’s floor crossing to the Liberals in 2005 helped save the minority Martin government for a time, but arguably galvanized Stephen Harper’s Conservatives in the forthcoming election in 2006. Some leave and come home again. The most famous example is Winston Churchill going Conservative-Liberal-Conservative. The aforementioned Jean Lapierre left the Liberals to join the Bloc Quebecois upon the election of Jean Chretien as Liberal leader. He returned to the Liberals under Paul Martin and was a senior cabinet minister in his government. Then there’s Joe Peschisolido who was a Young Liberal that was elected as an Alliance MP then crossed the floor to the Liberals. After a stint out of politics, he’s back again as a Liberal MP. There to stay, presumably. Gordon Wilson was Liberal leader in BC from 1987 to 1993. He left, with fellow MLA and wife Judi Tyabji, to form his own party, the PDA, and won his seat again in 1996 under that banner. He was recruited by NDP Premier Glen Clark to join the NDP cabinet in the late 1990s and then ran for the leadership of the NDP, unsuccessfully. Since 2001, he has been out of elected politics, but he did go ‘home’ again in 2013 when he made an intervention in that year’s election campaign in favour of BC Liberal Premier Christy Clark (who once worked for him) and against NDP Leader Adrian Dix (who once recruited him). Never dull in BC. Some floor crossings weren’t mean to be. BC Liberal MLA John van Dongen left the BC Liberals over unresolvable disagreements. He joined the fledgling BC Conservatives, but within months, left them over unresolvable disagreements. Conservative MP Eve Adams defection to the Liberals on the eve of the 2015 election reeked of desperation. Her career was soon over, at least for now. A husband and wife both crossed the floor from the New Brunswick PCs to the Liberals in 2007, but by 2010 they were both out of politics. One-term West Vancouver Liberal MP Blair Wilson got into some hot water and would eventually leave the Liberal Caucus to sit as an independent. Just before the 2008 election, he migrated to the Greens to become their first ever MP in Canada. He failed in his bid for re-election, as a Green. Some cross and never look back, like Scott Brison. Dr. Keith Martin was elected as a Reformer in 1993 and ran for the leadership of the Canadian Alliance. He crossed the floor to the Liberals in 2004 and served as a Liberal until 2011. David Kilgour was a longtime Progressive Conservative MP. Even though John Turner was his brother-in-law, he stayed as a PC, but after Turner left, Kilgour crossed to the Liberals and continued from there. Some floor-crossers are peripatetic. Paul Hellyer was elected as a Liberal MP in 1949 and went on to be Minister of National Defence under Lester Pearson and a major contender for the leadership of the Liberals in 1968, placing second on the first ballot. He fell out with Pierre Trudeau the following year and tried to form his own party. He then crossed the floor to the PCs and in 1976, he ran for the leadership of that party. He would return to the Liberals in 1982 and ran unsuccessfully for a nomination in his old seat in 1988. He then formed another party, the Canada Action Party, and would try to merge it with the NDP. At the age of 95, he may have another run in him, but for which party? Countless others have gone to sit as independents only to return later. Some are sent because they were naughty, others leave because they’re mad but come back once they’re happy. BC MLA Blair Lekstrom left caucus over the handling of the HST but came back after a leadership change. MLAs and MPs who never leave, and feel that they are team players, can often be annoyed and upset when those that leave are welcomed back. If handled properly, it can be seen as beneficial to the greater good that they return. Alternatively, it can be seen as rewarding bad behaviour. Surrey MP Chuck Cadman was elected as a Reform MP and carried on as an Alliance MP, but prior to the 2004 election, he lost his nomination. He ran as an independent and won. In 2005, battling cancer, he was pivotal in keeping Paul Martin’s minority government in power during critical votes, against the wishes of his former colleagues. In the ‘timing is important’ category, David Emerson’s defection to the Conservatives days after the 2006 federal election effectively marked the end of his career in electoral politics. The ink was barely dry on the ballots when he reversed course, causing much consternation among his former Liberal supporters. But it provided Stephen Harper with experience and depth in cabinet for two years and demoralized the Liberals, who sat out of power for nine years. Alberta PC MP Jack Horner crossed over to Pierre Trudeau’s Liberals in 1977, joining the Trudeau cabinet. There has rarely been a good time to be a federal Liberal in Alberta and this wasn’t one of them. His constituents did not reward him for his efforts in the subsequent election. Many, many, many more floor crossings happen in the imaginations of political back roomers. There is always the threat of a disgruntled MLA or MP taking off. Most of the time, that representative is governed by some restraint. The voters elected him or her largely on the basis of their party label. Imagine you worked hard in support of your party only to find that the recipient of your hard work crossed no-man’s land to sit in enemy trenches? Many would-be floor-crossers have surely taken a step back when realizing they would have to explain their actions to the volunteers who backed them. To be accepted by the voters, the conflict usually has to be real and substantive and/or that representative must have a lot of personal credibility. If it’s opportunistic, and imposed from the top, it’s not likely to go down well with the voters or the supporters of the sending and receiving party. Not many like a turncoat, especially when they weren’t part of the process. What floor crossings can demonstrate is the dynamic state of our political system. In the ‘first past the post system’, parties are always in a state of constant movement. Parties continually search for a plurality of votes and seats, and attracting someone who represents a set of ideas or representative of a community of interest is a way to grow a party’s base. A floor crossing can give a tiny party a foothold in Parliament. Parties that fail to unify their members behind a common purpose can disintegrate, with floor crossings one such manifestation. Unlike the United States, Canadian parties can rise and fall (and rise again). There is much more fluidity. Real policy differences – such as Quebec independence – can lead to dramatic changes and fracture coalitions. Strong leadership glues coalitions together, unifying disparate elements. When it comes down to it, elected representatives are just people, unbound to their party label. They have the ability to exercise their free will. Many floor-crosses vaporize without causing any major effect. Will the departure of Leona Alleslev amount to much? Will Maxime Bernier accomplish anything? History tells us that we will have to wait to find out. There are many possibilities. There are many more colourful examples. As University of Manitoba Political Science professor Royce Koop puts it, “When an MP crosses the floor, it’s a beautiful reminder that in Canada we cast our votes for candidates, not parties”. NDP leader Jagmeet Singh announced his bid for a federal seat today in the riding of Burnaby South, vacated by Vancouver mayoralty aspirant and NDP incumbent Kennedy Stewart. Burnaby South is over 4,000 km from Singh’s former riding in the Brampton area, but he’s certainly not the first federal leader to leave his home province to seek entry into the House via a by-election. Rt. Hon. Brian Mulroney was elected in 1983 as MP from the riding of Central Nova in Nova Scotia. He gave the seat back to Elmer MacKay when he led the 1984 election from his hometown riding of Manicouagan in Quebec. Rt. Hon. Stephen Harper found a seat close to home in 2002 when he re-entered the House from Preston Manning’s seat of Calgary Southwest. Rebel founder Ezra Levant had secured the nomination but was evidently persuaded to step aside for the new leader of the Canadian Alliance (this was before the Alliance and PC’s merged). Of note, both the Liberals and the PC candidate, Jim Prentice, stepped aside to make way for Harper. The NDP fielded a candidate. Rt. Hon. Joe Clark made a political comeback to return as leader of the Progressive Conservative Party in 1998 and sought election to the House of Commons in early 2000 when then-PC MP Scott Brison stepped aside in Kings-Hant to make way. As for Liberals, the longest-serving Prime Minister of all-time, Rt. Hon. William Lyon Mackenzie King, lost his seat in York North in 1925 and sought a new seat in Prince Albert, Saskatchewan, winning a by-election there in February 1926. An interesting side note is that Rt. Hon. John Diefenbaker encouraged an independent to run against King in the by-election, then Diefenbaker himself ran unsuccessfully against King in the subsequent 1926 general election. King would continue to represent Prince Albert until the 1945 election when he lost to a CCFer. He sought re-entry into the House via Glengarry in Ontario and retired while representing that seat. Rt. Hon. John Turner was the newly appointed prime minister, without a seat, when he announced he would contest the 1984 election from Vancouver-Quadra. While he had attended UBC and had a longstanding family connection to BC, he had lived in Eastern Canada for decades and did not pretend too hard that he would actually move to Vancouver. Despite the disastrous national campaign, Turner held on to claim Quadra from the PC’s and the Liberals have held it for the past 34 years. The NDP can look back at the experience of Tommy Douglas. Douglas was defeated in his first attempt to win election to the House of Commons from the riding of Regina-Centre in 1962. The former Saskatchewan premier, and first elected leader of the NDP, had to find a seat out-of-province in… Burnaby. He was elected in Burnaby-Coquitlam in 1963 and 1965. In 1968, he contested Burnaby-Seymour (similar to MP Terry Beech’s current riding) and lost to Hon. Ray Perrault. Perrault was a former leader of the BC Liberal Party and a gritty, grassroots politician. While he would only serve one-term, he went on to a distinguished career in the Senate. As for Douglas, his opportunity to regain a seat was borne from tragedy when Nanaimo-Cowichan-The Islands MP Colin Cameron (grandfather of NDP strategist Robin Sears) passed away not longer after the 1968 election. Douglas won a 1969 by-election there and represented the seat until 1979. Topical in the news these days is Rt. Hon. John A. Macdonald who was elected in Victoria in 1878. I assumed it was a by-election victory, but he actually contested three separate ridings in the general election that year, and, having lost in Kingston, he chose to represent Victoria where he had defeated Liberal Amor de Cosmos (!). Sir Wilfred Laurier also contested multiple districts and won in both Quebec-East and Saskatchewan provisional district in 1896, choosing to represent Quebec-East. Green Party leader Elizabeth May announced on August 16th that due to “longstanding parliamentary tradition” she would extend ‘leader’s courtesy’ to Jagmeet Singh by not fielding a Green candidate. Every leader noted above has been contested in a by-election, and since 1962, every leader has been contested by at least one other main political party. The NDP have never extended Leader’s courtesy in a by-election. Even the Greens contested Harper’s by-election. And certainly on a provincial level, neither the Greens nor the NDP honoured the “longstanding parliamentary tradition” of leader’s courtesy to Hon. Christy Clark in her two by elections (Point Grey in 2011, West Kelowna in 2013). Courtesy aside, leaders need a seat in the House and sometimes have to go far afield to find one. When they are ‘adopted’, sometimes they stay put. Singh says he will move to Burnaby. But can Jagmeet Singh win Burnaby-South? Presumably, the NDP have polled the riding and believe they can win it. It would be a huge risk, otherwise. It does not appear to be a slam-dunk seat for the NDP though. In 2015, Liberal Adam Pankratz won election day. It was Kennedy Stewart’s margin-of-victory in the advance polls that saved his bacon. This was a result of two factors – Liberal momentum was still building during the advance polls and the NDP had a superior GOTV machine. Liberal gains in 2015 came at the expense of both the NDP and the Conservatives. Pankratz himself, a young, educated multilingual candidate whose father was a well-known BC Lion football player, presented well for the Liberals. There are other variables to consider. The federal NDP typically does not do well in British Columbia when there is an NDP government in Victoria. The 1974 election was a disaster for the federal NDP, in the height of the Dave Barrett government. The federal NDP were decimated in the 1993, 1997, and 2000 elections in BC while a parade of NDP premiers governed (though Svend Robinson held his Burnaby riding). Will it be a factor this time? At this point, I don’t think the provincial NDP have angered voters in the manner of previous NDP governments. It’s early days. However, being in power can demotivate activists who are accustomed to fighting the establishment rather than being a part of it. Singh’s connection to BC is not apparently strong. He will have recruited support during his NDP leadership run in BC, especially from the South Asian community. But he lacks the personal ‘story’ that Mulroney had in Nova Scotia (he attended university) or Turner had in BC. Maybe there is one that I haven’t heard yet, and it may not matter that much anyway. Another factor is Kinder Morgan. On the surface of it, the NDP have this field to themselves. The NDP Mayor of Burnaby, a formidable force, strongly opposes the pipeline. The Liberals and the Conservatives are on the other side of the debate. Assuming the Greens can be kept at bay (a big assumption), the NDP may have room on that issue. But is the worm turning on this issue? The protest camp has been drawing negative attention. Are people ‘worn out’ on all of the Kinder politics? We’ll see. Municipally in Burnaby, Mayor Derek Corrigan has ruled since 2002. He has built a strong political machine. For the first time in a long time, he faces a credible challenge this October. Will that divert energies away from Singh’s campaign? Will the winds of change blow away from NDP candidates? Opponents hope, but I know from experience that the NDP machine in Burnaby is real. It will take a lot to defeat them. Singh has to get the most out of the local organization. About 46,000 residents voted in 2015. In a by-election, the turnout is almost always lower. GOTV will be a huge factor. Not just the ‘machine’ but the motivation of voters to vote. Will they turn out for Jagmeet Singh? He will have to build a connection with them. Kennedy Stewart’s departure may be another factor. Vancouver mayoralty candidates will be taking shots at Stewart for leaving his post as a Burnaby MP to run in another jurisdiction. It turns out Stewart was living in Vancouver – how is that going over in Burnaby? Issues like “demovictions” are being raised in Burnaby which could make life uncomfortable for NDPers. It may all amount to nothing and the status quo may well prevail. We’ll see how the opposition approaches it. Singh obviously has the most to win and lose. A win gets him into the House while getting a weight off his back. A loss could be curtains for him. Some Liberals may want Singh to win, preferring his leadership to an unknown alternative that could present itself in the aftermath of a Singh by-election loss. Liberals ought to be concerned about the Conservatives winning though. As the 2011 results show, the Conservatives were not far off. The Liberals could consider not running a candidate, as was the case with the Stephen Harper by-election in 2002. This would be a bit surprising given their narrow margin of defeat in 2015. They might also yield the seat to the Conservatives if they fail to contest it. We will most likely see all parties in it. It will be an interesting test of the three parties. We have seen the Liberals steal a Conservative seat in White Rock and the Conservatives steal a Liberal seat in Chicoutimi in recent by-elections. Local factors played a big role, but this by-election will take on more of a national dimension. The upshot is that Singh is the favourite but there are a lot of reasons why this may not be an easy ride. It’s not a slam dunk. He does not have the advantages of being a sitting prime minister and not especially well-known in British Columbia. The riding was a close call in 2015. It’s a risk, but politics often rewards the risk-takers. Or buries them.